Don't just eat for a better body. These five tips can get you better skin, too! We all know coconut oil is a great moisturizer, make-up remover and even makes an awesome body scrub. 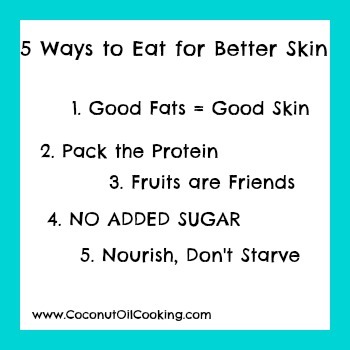 But did you know eating coconut oil can also help your skin? Jennifer Irvine, founder of The Pure Package and Balance Box and a London-based health food guru, shared her five tips on what to, and what NOT to, eat for better skin with Marie Claire UK. Even I’ve had a hard time with this concept. But more and more research shows just how good quality fats can be for our diets. Don’t be afraid of the good fats such as nuts (almonds, brazil, hazelnuts and walnuts are best), avocados and good quality oils such as coconut oil – it is all about portion control and balance. A handful of nuts for a mid-morning or afternoon snack is ideal. These provide essential fatty acids which act as a natural moisturizer for your skin, helping to keep it supple,” Jennifer explains. Jennifer isn’t talking about isn’t a good ol’ fashion steak necessarily. She says finding protein in vegetables, like sweet potatoes and avocados, can help rebuild collagen in your skin. Of course, collagen is what keeps our skin soft and supple, so yes, I’ll be filling my plate! But don’t forget about fruits. Vitamin C found in kiwis and oranges can also boost collagen, she says. Even adding fresh lemon to your daily 8 glasses of water can help your skin look more glowy. Whatever you do, Jennifer says, starvation diets are not the answer – for your body or your skin. Following these steps can give you a better body inside and out!